Transformation of Physcomitrella patens has been performed with the polyethylene glycol (PEG)-mediated DNA introduction to protoplasts, with the particle bombardment to live cells (see 9.2), and with the agrobacterium-mediated DNA introduction to protonemata or protoplasts (see 9.5). The PEG-mediated DNA transfer method is the most efficient and feasible for homologous recombination mediated-gene targeting. DNA bombardment usually provides unstable transformants without recombination into Physcomitrella genome and is mainly used for transient assay. 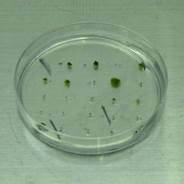 Agrobacterium-mediated method is used for a specific purpose; such as high-throughput screening (see 9.5). 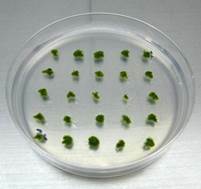 (1) Inoculate a piece of protonemata with tweezers to BCDATG medium and cultivate for three weeks. 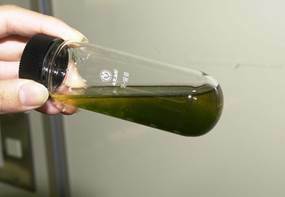 The original protonemata are usually composed of chloronemata and caulonemata. We will make chloronema-rich protonemata by the following procedures, because transformation rates of chloronemata are higher than those of caulonemata. (2) After each inoculated protonemata forms a colony after three weeks, move three colonies to a test tube with 25 mL sterile water and chopped with a Polytron homogenizer (Kinematica, AG, Lucerne, Switzerland) for 10 sec at the minimum speed of the Polytron PT2100 with a DA2120/2 generator shaft or at speed level 4 for the Polytron model K with a PTA20TS generator shaft. (3) Spread 2.5 ml of the solution of chopped protonemata on a pretreated cellophane sheet layered on BCDATG medium (see 2.2) in a 9-cm Petri dish. Incubate the inoculated Petri dish at 25°C under continuous white light (at an intensity of 30-80 µmol m-2 s-1) for 7 days without sealing the plate. 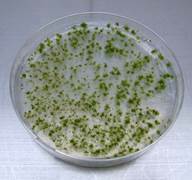 (4) Collect all protonemata on the plate, chop with the above conditions, spread, and cultivate as (3) for three times and you can get chloronema-rich protonemata. 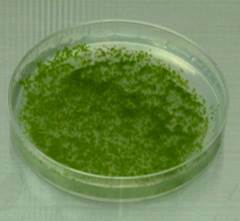 (5) Collect the chloronema-rich protonemata of (4), chop with the above conditions, spread, and cultivate under the same conditions for 3 to 5 days instead of 7 days. The regeneration rate of protoplasts is critical for transformation efficiency. Protonemata grown for 3 to 5 days after spreading should be used for protoplast isolation. Older protonemata cause dramatically low transformation efficiency. 1. Culture E. coli harboring plasmid DNA. 2. Prepare plasmids using QIAGEN Hi-Speed Plasmid Midi Kit or Promega Wizard Mini-prep Kit or other similar kit. 3. Digest the plasmid DNA with an appropriate restriction enzyme to linearize. 4. Purify the digested plasmid with phenol/chloroform extraction and precipitate by adding 1/10th the volume of 3M NaOAc (pH5.2) and 2 volumes of ethanol. 5. Dissolve the precipitated plasmid with TE, adjusting at the concentration of 0.2~1.0 µg/µl. * If you use PCR amplified DNA fragments, PCR products should be ethanol-precipitated with 1/10 volume of 3M NaOAc (pH5.2) and resuspend in TE. 1. (Day 1) Culture protonemata after chopping. Grow them at 25˚C for 4 days (or 3 to 5 days). 2. (Day 4) Chop propagated protonemata again and grow them at 25˚C for 4 days on a new plate. 3. (Day 8~9) Transformation followed by incubation of transformed protoplasts in a top agar for 3 to 5 days. 4. 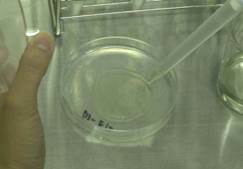 (Day 12) Transfer the top agar containing regenerating protoplasts onto a selection plate supplemented with antibiotics. Cultivate for more than 3 weeks on the selection medium. 5. 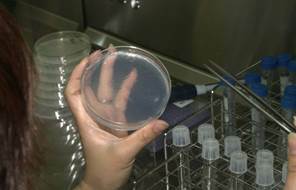 (Day 43; 3 weeks after TF) Transfer a fragment of a colony grown onto the 1st selection plate to an antibiotic-free plate. Incubate for more than one week. 6. (Day 50; 4 week after TF) Transfer a fragment of a colony grown on the non-selection plate to a selection medium supplemented with antibiotics. Incubate for more than one week. 7. (Day 57; 5 weeks after TF) Select each survived colony on the selection medium as a stable transformant. All of the following stock media are stored at 4˚C. 1. Add 0.5 g of Driselase in a 50 ml conical tube and add 25 ml of 8% mannitol solution. Mix well. 2. Add 1 ml of 1 M Ca(NO3)2 and 100 µl of 1 M Tris-HCl (pH8.0) into 9 ml of 8% (w/v) mannitol solution and mix. Filter the solution with a 0.22 µm filter. 3. 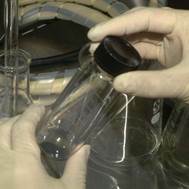 (Preparation of PEG/T) Add 5 ml of the filtered solution to the autoclaved PEG (see above). Dissolve PEG completely. This solution is called PEG/T. 4. (Preparation of MMM) Mix 910 mg of mannitol, 0.15 ml of MgCl2, 1 ml of 1% MES (pH5.6) and 8.85 ml of H2O. Filter the solution with a 0.22 µm filter. This solution is called MMM. 5. Switch-on two water baths at 45˚C and at 20˚C. 6. Centrifuge the driselase solution at 4,000 rpm for 5 min. 7. 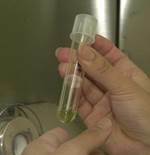 Transfer the supernatant to a 50 ml syringe with a 0.45-µm filter-unit and filtrate into a 50 ml centrifuge tube. 8. 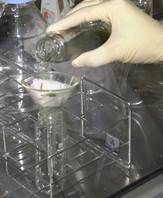 Transfer the propagated chloronema-rich protonemata (1 to 2 g fresh weight, which are collected from 10 plates) into the Driselase solution with sterile tweezers. Since protonemata growing close to the edge of a Petri dish may be contaminated with bacteria, we collect protonemata more than 1 cm inside from the edge. Then incubate at 25˚C for 30 min. Mix gently every 5 min. 9. Filtrate the protonemata through 50-µm nylon-mesh. 10. Centrifuge the filtrated protoplasts at 1,000 rpm (180 x g) for 2 min at room temperature (22°C), and resuspend gently in 40 ml of 8% (w/v) mannitol. Repeat this washing procedure twice. 11. Count the number of resuspended protoplasts with hemacytometer and re-suspend at 1.6 x 106 ml-1 in MMM solution. 12. 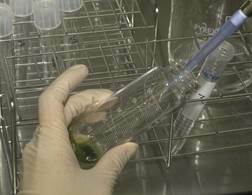 Add 30 µl of plasmid DNA solution into a 15 ml round-bottom tube (Falcon 2057). Then, add 300 µl of the protoplast suspension and 300 µl of PEG/T solution to the tube. Mix gently. 13. Incubate the tubes containing the transformation mixture in the 45˚C water bath for 5 min, then in the 20˚C water bath for 10 min. 14. Dilute the transformation mixture with adding 5 aliquots of 300 µl protoplast liquid medium at 3 min intervals and then 5 aliquots of 1 ml of protoplast liquid medium at 3 min intervals. 15. Pour the diluted protoplast solution into a 6 cm Petri dish, seal it with Parafilm, and incubate at 25˚C overnight in darkness. ・ Resuspend the protoplasts in the MMM solution with gently pipetting if protoplasts aggregate at the bottom of the centrifuge tube. 1) Cut cellophanes to a little bit smaller than the size of a 9 cm-petri dish. 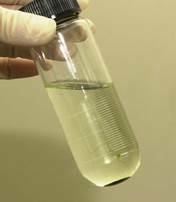 2) Place cellophane in a 500 ml beaker (usually ** seats) and then add 5 mM EDTA solution (pH8.0). Autoclave. 3) Wash with MilliQ water several times. Add MilliQ water in the beaker. Autoclave. 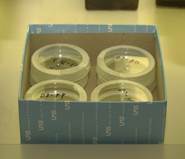 4) Place cellophane in a glass petri dish and add MilliQ water, then autoclave. 2) Place cellophane in a 500 ml beaker and then autoclave. * Agar provided by NAKARAI is not appropriate. 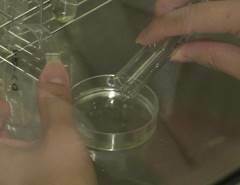 ・ PRM/B (1,000 ml); Autoclave and pour to 9 cm petri dishes. Dishes are preserved at room temperature. All stock media are stored at 4˚C. Stock D should be used within 2-3 months, before iron precipitates. 1. Overlay a sheet of pretreated cellophane on a 9 cm-dish containing PRM/B medium. 2. Transfer the protoplast suspension into a 15 ml polypropylene conical tube (15 ml, 17 mm x 120 mm, BD Falcon tube, no. 352196, Becton Dickinson, Franklin Lakes, NJ) with a pipette and centrifuge at 1,000 rpm (180 x g) for 2min at room temperature (22°C). 3. Discard the supernatant and add 8 ml of a PRM/T medium stored at 45°C. Re-suspend the protoplasts by pipetting. 4. Pour 2 ml of the protoplast suspension on the pretreated cellophane layered on a PRM/B medium. 5. Seal the Petri dish using a surgical tape. Incubate the plate at 25˚C for 3 days under continuous white light with a light flux of 30 - 80 µmol m-2 s-1. We usually use 50 µmol m-2 s-1. After autoclaving, allow to cool to ~50˚C and add appropriate antibiotics into the medium. Store at 4˚C. 50 mg/mL solution is available from Invitrogen (no. 10131-035). Use at the final concentration of 20 mg/l. 50 mg/mL solution is available from Invitrogen (no. 10687-010). Use at the final concentration of 20 mg/l in the medium. 100 mg/mL solution is available from Invitrogen (no. R250-01). Use at the final concentration of 50 mg/l in the medium. Zeocin is light sensitive. Store zeocin solution and plates or medium containing zeocin in the dark. One g of Blasticidin S, Hydrochloride (Funakoshi Co. Ltd KK-400) is dissolved in sterile water in a laminar cabinet, dissolved at 45°C for 10 min, pour 1 mL each into sterile 1.5 ml tubes. This stock solution is preserved at 4°C and use within 6 months. The stock solution is dissolved at 45°C for 10 min and used at the final concentration of 100 mg/L. LEXSY NTC (Jena Bioscience, no. AB-101S) is the trade name for the natural product nourseothricin (a complex of the streptothricins F and D) produced by Streptomyces noursei . Use at the final concentration of 75 mg/l in the medium. 1. Insert tweezers under the cellophane and transfer the protoplasts all together by lifting the cellophane disc with tweezers to a BCDAT medium supplemented with adequate antibiotics. 2. Seal the Petri dish with a surgical tape. Incubate it at 25˚C for 3~4 weeks under continuous white light. ・ Zeocin is light sensitive and zeocin plates have to be preserved in the dark before use. 1. Transfer each colony under antibiotic selection to antibiotics-free BCDAT medium. Tweezers are sterilized with 70% alcohol and fired each time after transfer. 2. Culture at 25˚C for 1 week under continuous light. ・ Transfer each colony one by one to a selection medium to avoid generating a chimeric colony. ・ Incubate the plate for more than one week. 1. After the incubation for one week without antibiotics, transfer a small part of each protonemal colony to the BCDAT medium supplemented with adequate antibiotics. A small part of a colony should be transferred to remove chimeric colonies. 2. Seal the plates with a surgical tape and incubate for one week. 3. Stable transformants grow on the plate. ・ Transferred protonemata should be collected from the leading edge of a colony to prevent collecting chimeric clones. Do not transfer a whole colony or gametophores. ・ When using plates containing zeocin, ensure they are freshly prepared. ・ Some kinds of disruptants may show reduced growth. Do not miss positive transformants even if growth of the colony is reduced. ・ PEG-mediated transformation generates polyploids by protoplast fusion. Morphology of polyploid protonemata is not distinguished from that of wild type. DNA amount of transformants should be examined using flow cytometry (see chapter 8. Flow Cytometry Analysis).